More Americans go inside convenience stores to buy caffeinated beverages than for any other reason. The tripod of modern living stands on three legs: Convenience, time-saving, and mobility. Just look at digital devices, fast food, and caffeine. Seattle became famous for its drive-through coffee spots. Coffee is a cash cow for McDonald’s and Dunkin’ Donuts. And now tea is beating out coffee and soda at some cash registers. Caffeinated drinks – including coffee, iced tea, sodas and energy drinks – are what keep the local mini-mart in business, and what keeps their mobile customers on the go-go-go. Coffee’s hot all year, but in summer, iced tea sales soar. Instant iced tea was the big 20th century boost for tea. It first entered the consumer market in 1953, and when Lipton Instant Iced Tea arrived in 1958, iced tea really took off. 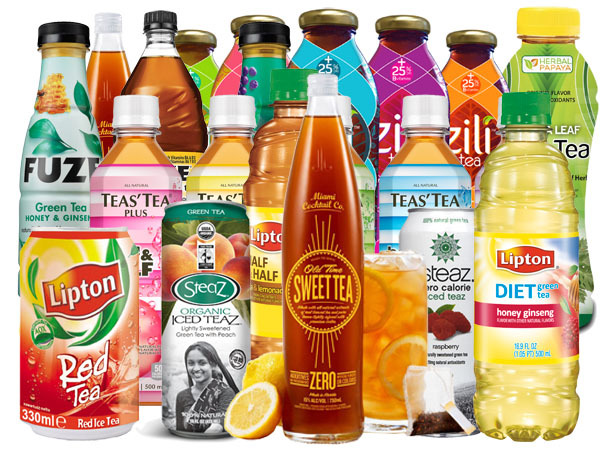 When Snapple introduced bottled iced tea almost thirty years later, it created a whole new beverage category: Ready-to-Drink tea is now led by brands like AriZona, Fuze, Honest Tea, Sweet Leaf, and the giants Lipton and Nestea. Bottom line: When tea became instant, sales took off. When it became cold, instant and ready-to-drink, tea joined the ranks of coffee and colas as a powerful caffeinated player – at least in the U.S. In Asia and other substantial portions of the globe, hot tea remains the main caffeinated beverage, but iced tea increasingly appeals to a young, cosmopolitan market. Overall, tea is second only to water as the most widely consumed beverage worldwide, a fact often mentioned. But did you know: More tea is consumed worldwide than coffee, chocolate, alcohol and soft drinks combined. After the American Revolution, tea’s popularity declined severely in the U.S. A hundred and fifty years later, specialty blends gave tea a big boost, especially Constant Comment in 1945 and more recent upscale brands like Republic of Tea and Tazo (now owned by Starbucks). Reports of the health benefits from tea’s antioxidants also kicked up consumption. In 2011, over 65% of the tea brewed in the United States was prepared using tea bags. Ready-to-Drink and iced tea mix comprises about one fourth of all tea prepared in the U.S., with instant and loose tea accounting for the balance. Instant tea is declining and loose tea is gaining in popularity, especially in Specialty Tea and coffee outlets. On any given day, about one half of the American population drinks tea. On a regional basis, the South and Northeast have the greatest concentration of tea drinkers. As with coffee in the 20th century, the perception of “premium” quality gave tea traction. During the last fifty years, tea has been marketed as a special treat, bringing caffeine, pleasure, and reward to the tea-drinking brain. So next time you pop into a mini-mart to pay for your gas, take a look at the 53 or so brands of tea in the cooler. Since ready-to-drink iced tea has brought a new level of passion to consumers, you’d be right to say it’s a really “hot” product.